Daniel Shepley (right), Commissioning Technician with Pat McCluskey (left), co-founder of ANCA. Advanced technology manufacturer ANCA recently celebrated the graduation of four highly skilled technicians from their apprenticeship program that launched in January 2011. Having been unable to recruit young engineers and trades people to join their ranks, the privately owned company decided to establish their own apprenticeship program designed to offer participants a range of technical training paths in CNC machining; machine building; fault finding and analytical skills; machine commissioning and customer service. Commissioning Technician Daniel Shepley, who graduated the ANCA Apprentice 2019 program this month and subsequently won the company’s Apprentice of the Year award, said the program helped him to master ‘different skills in different areas’ and meet heaps of great people. “My proudest achievement over the time of my apprenticeship would probably be the first time I was sent overseas. I was sent to Weinheim in Germany for three months to support ANCA’s German branch. It was a challenge working on some unfamiliar tasks but I learnt lots and was happy with the job I did,” Mr Shepley said. “Now that I have finished my apprenticeship I want to continue to work in areas of the business that will allow me to continue to learn as much as I can. I am currently working in the commissioning department. I plan to start my advanced diploma in mechatronics at night school. Stuart Gurney, Apprentice Master said ANCA has a proud history of investing in its people to develop a highly skilled and engaged workforce. “My apprentices get exposure to CNC machining, precision fitting, electrical testing and grinding applications throughout their four-year program,” Mr Gurney explained. “My passion is supporting the next generation of talent to enter the fascinating world of CNC grinding. Far from just being a manufacturing company we sell 99% of our product overseas and compete with German, Swiss, Japanese and US competitors successfully. Participants in the program start with 12 months of training in ANCA’s Apprentice Training Facility under the responsibility of the Apprentice Master. In the second year they have the chance to be part of a rotation program through various aspects of the business to ensure they receive a comprehensive education and gain exposure to a range of divisions. ANCA said the first year TAFE requirements are provided onsite by an accredited trainer and for the years following, all apprentices will attend TAFE one day per week during the TAFE terms. At the end of the four years, successful apprentices are trade qualified in their chosen stream. 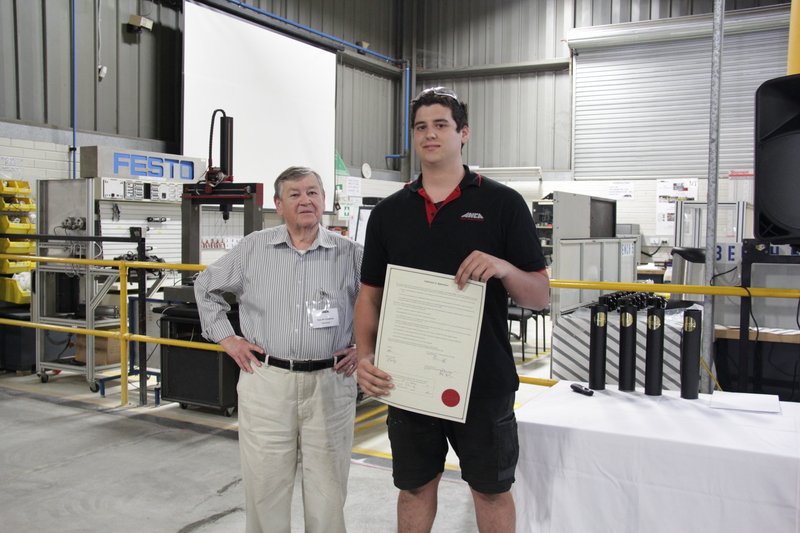 Image caption: Daniel Shepley (right), Commissioning Technician with Pat McCluskey (left), co-founder of ANCA.